Graduate Emily Turner. Add Victoria Bossong. Push the reset button and watch the machine run. That about sums up the differences between the 2018 Maine State Girls Class A Championship and the 2017 Championship. 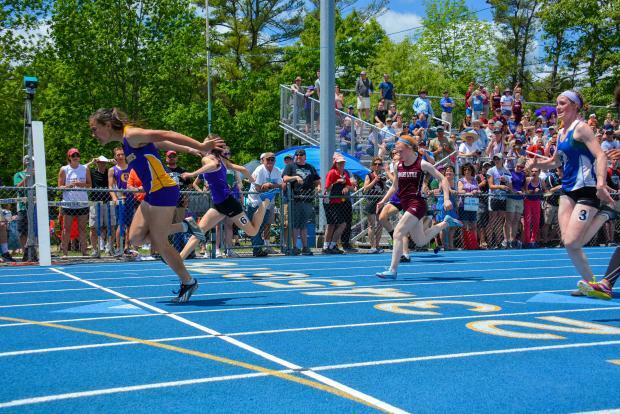 Dominating the short distances and the sandy jumps, taking first in the 4 x 400 and second in the 4 x 100 the Cheverus Stags defended their 2017 State Championship ending with 84 points and a 20 point cushion over runner-up Thornton Academy. The Trojans were the runners-up in 2017 as well. To be sure here were subtle differences, the Stags margin over the Trojans was a little more comfortable this season. And Thornton Academy, which only claimed its runner-up spot in 2017 by a half point had a 15 point cushion over third place Gorham this season. In fact, very little changed throughout the meet. In addition to Cheverus repeating as Champion several individuals either repeated as champions or were right in the mix for titles. In a gloomy bit of forecasting for a passel of Class A coaches, of the nine Stags to score just one, Ashley Turner, is a senior. 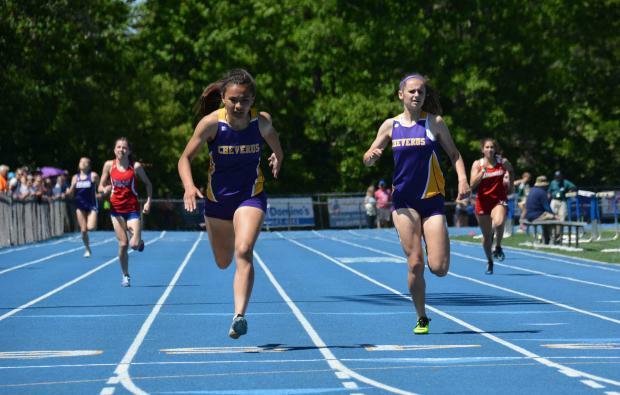 Turner took a leg of the meet's opening race, the 4 x 800, with juniors Rosie Train, Sophie Pompeo, and Hannah Galeucia helping put Cheverus on the board with a sixth place finish. Otherwise Cheverus scoring was led by junior Emma White with a first in the long jump (17-05) to defend her title for 2017. She also collected a first in the triple jump (37-04), and a third in the 100 meter hurdles (15.52) while setting new personal marks in each. To cap the day White also took a leg of the winning 4 x 400 team. White's triple jump left her tied with Westbrook's Nyagoa Bayak who had bested White by an inch in 2017. This year White prevailed on jumps. On White's heels was the first year Victoria Bossong with titles in the 100 (12.18) and 400 (56.95). In the 400 Bossong just edged teammate Emma Gallant, last season's freshman phenom, who crossed the line at 57.43. Bossong also took a leg of the winning 4 x 400 team along with the second place 4 x 100 team. The final individual champion for the Stags was Gallant who claimed top spot in the 200 with a run of 25.57. Gallant was also in on both the 4 x 400 and the 4 x 100 teams. Wind aided the short distances most of the day, nonetheless the time marks for White, Gallant, and Bossong are in the books as new personal bests. 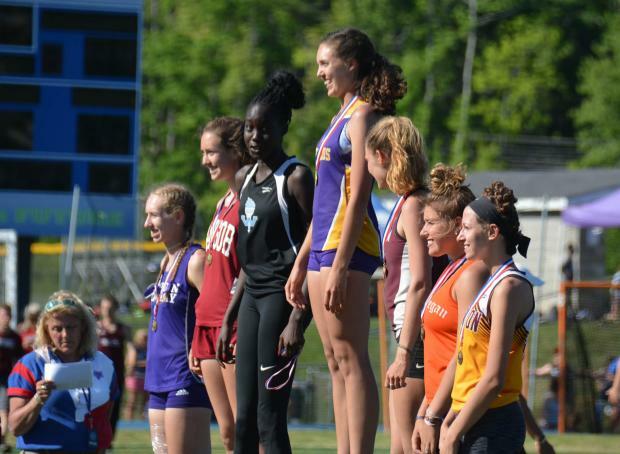 Another first year, Helena Bolduc, earned medals in both the 4 x 100 and 4 x 400 teams, while junior Evelyn Hanley rounded out the 4 x 100 team and the scoring for Cheverus. In 2017 Cheverus took the team title with five-firsts, three-seconds, and just five girls scoring for a total of 74 points. This season the Stags amassed 84 points with six-firsts, two-seconds, a third, and a sixth place finish. Nine competitors contributed to the scoring and just one is a senior. Push the reset button for 2019. But look for the Trojans to be there in 2019 also. Like Cheverus, Thornton Academy won't lose much to graduation. 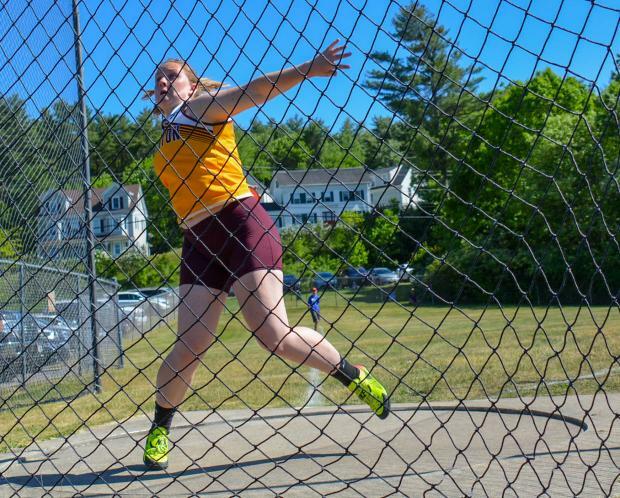 The lone senior putting up points for TA was Paige Boudreau who took the fifth spot in the discus. The Trojans were able to put three throwers on the discus podium as sophomore Jaigan Boudreau took first with a hurl of 112-02. Johnna Scott took the fourth spot (102-09). Jaigan Boudreau and Scott also went six-seven in the shot put to add points for the Trojans. Thornton's 4 x 100 team, with the exact same cast of Sabria Merrifield, Kieya Dion, Katie-Marie Roy, and Mia Taranko bettered their 2017 time by 0.4 to finish at 50.15 and defend their 2017 State title; they had entered the 2018 meet seeded first at 50.09. Mia Taranko added a second place finish in the long jump where her leap of 17-03.25, left her just an inch and three-quarters off the top spot. 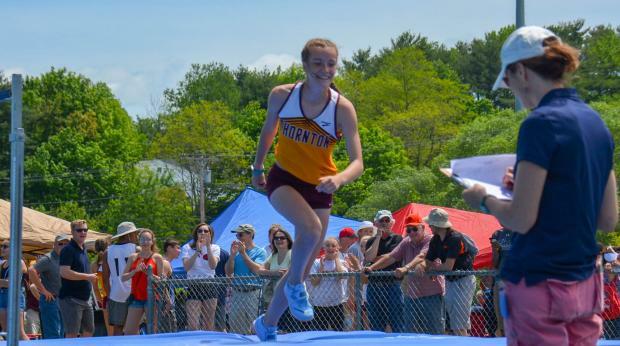 Sabria Merrifield added a third in the 100 (12.54), while Katie-Marie Roy vaulted 10-6 to match the height of Edward Little's Lauren Berube, but conceded the title to Berube on jumps. Roy also helped out with a leg of the sixth place finishing 4 x 400 team. In addition to Roy, Annie Duong, Kylie Bedard, and Allie Gross completed the 4 x 400 team. Bedard and Gross rounded out TA's scoring with a 4th in the 300 hurdles for Bedard and a third in the high jump for Gross at 5-4. The girls high jump presented a tight battle for second place. Each of the seven scorers established a new personal mark starting with EL's Olivia Jalbert in seventh at 5-0. But finishers two through six all cleared 5-4 to set new personal marks and match the height 2017 Nyagao Bayak Champion won with. Portland's Jaidyn Appel took second, Allie Gross of TA was third, Leah Savage of Skowhegan took fourth, Noble's Tessa Cyr was fifth, and Annika Hester from Falmouth was sixth. All five cleared 5-4 with the scoring differences determined by jumps. Appel and Gross may have been robbed of 5-6 by the breeze as both had hit the pads with big smiles only to hear the bar jiggle free before they could scramble down to the apron. As jumper after jumper came off the pad glowing from the new heights and cheers of the crowd, Bayak smiled along with them and cheered them on their efforts at 5-6, but it was clear she had something bigger on her mind. After winning it at 5-6 Bayak murmured, "Everyone else is setting a record today, I want one too." 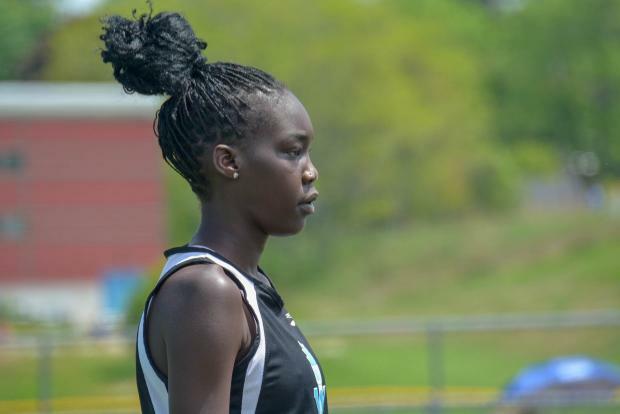 Bayak, a junior, came into the meet as defending champion with a personal best of 5-10.25 and her eyes on a ten year old meet record of 5-09 held by Jess Labreck of Messalonskee and the University of Maine. Bayak took the meet record at 5-10, moved to 5-11 for a new personal mark, and thrilled the crowd with her efforts at 6-0. She would have placed fifth in the boys meet. 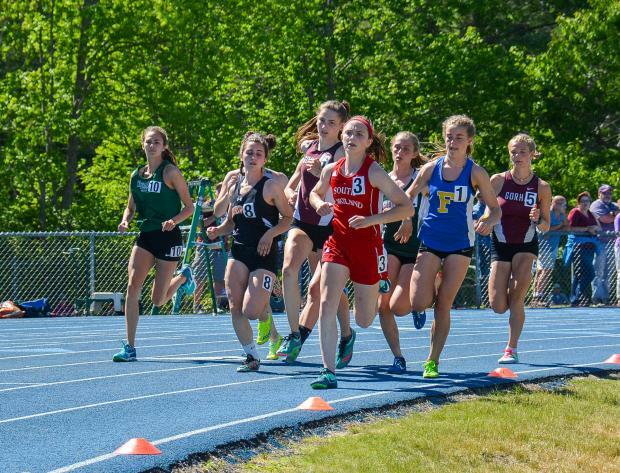 Graduation won't plague Cheverus or TA, but third place Gorham will suffer a gut punch when senior Anna Slager takes her running skills to Tufts University in the fall. Eschewing the tendency of distance runners to save their legs for open events, Slager took a leg of the 4 x 800 and took it our hard. Slager ended the day with the baton in the 4 x 400 and managed to squeeze in a second place finish in the 1600 (5:17.22), and a third visit to the podium with a gritty seventh place finish in the 3200 for an unofficial meet record of 6000 meters. The Rams 4 x 800 team produced plenty of points as Kate Tugman also placed in the 1600 while Iris Kitchen added points in the 800. 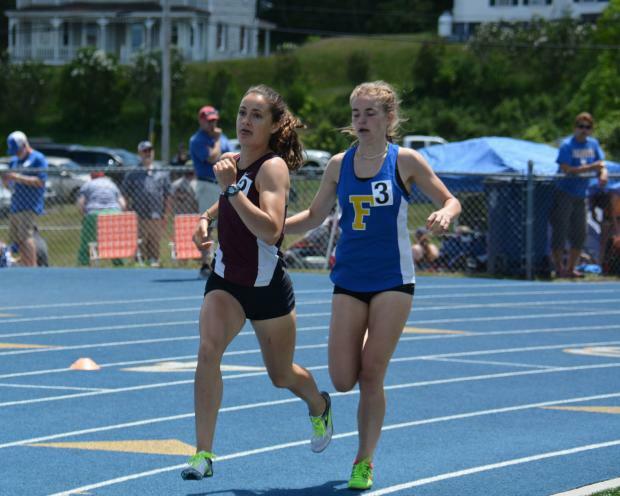 The 800 was won by Falmouth's Malaika Pasch (2:21.95) who doubled up with another win in the 1600 (5:14.18). 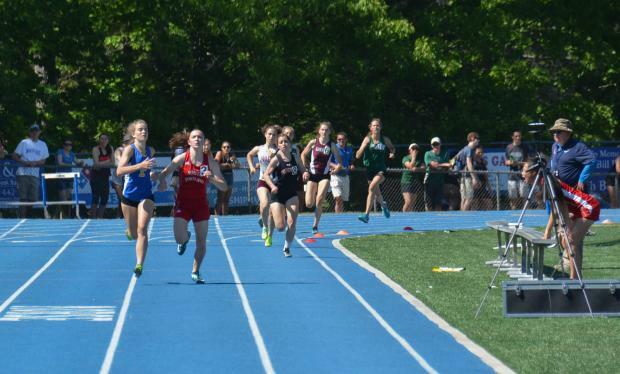 As expected Pasch faced a big challenge in the 800 from a South Portland runner, but it wasn't two-time defending Champion Juliana Selser, it was sophomore Anna Folley. Selser was a late scratch due to injury. There was plenty of contact in this race as the fastest of the three heats had nine competitors and was started on one line. The earlier two heats had been waterfall started to avoid early crowding. With a lot of jostling in the back of the pack, Folley broke to an early lead. There was still more contact late in the race as at the last corner with 100 to go Folley edged outside to hold her position. Folley and Pasch brushed each other in stride and came down the home-stretch with Pasch nearly in the third lane. Maddie Wayne of Brunswick held the inside lane for third. The final podium spot went to first year Eliza Parker of Hamden who edged Marshwood's Ella Nelson to win the second heat. The pair had to wait to see if their times might hold up once the third heat finished Parker's did and she earned the last podium position. Pasch had some contact in the 1600 too but it was early enough that she claimed the win at 5:14.18 with just about a three-second margin on Gorham's Anna Slager. The Rams and Bonny Eagle Scots showed their cross-country chops in this race taking four of seven spots. Kate Tugman took fourth for Gorham while Christine Toy was third for the Scots and Amelia Alexander took the last spot. Fellow harrier from Edward Little Jillian Richardson took fifth. Richardson, Toy and Slager all also placed in the 3200, but that race belonged to Toy's teammate Ami Beaumier. The junior rules this distance; she is the defending Champion for the outdoor season, and holds the indoor title in the two mile as well. 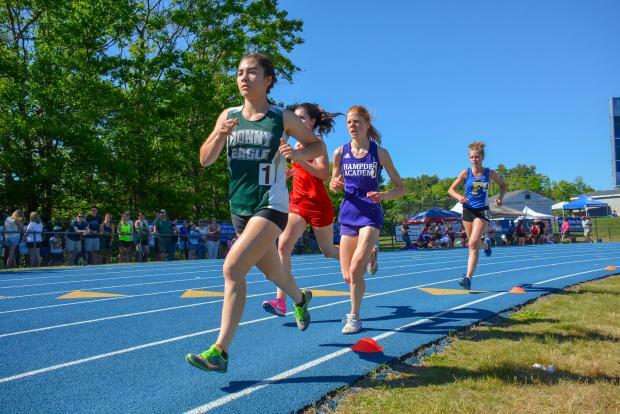 In 2017, she needed the last 200 meters to overtake Falmouth's Malaika Pasch, this year the last 800 meters were a back and forth with Hampden's Helen Shearer, the fifth finisher in 2017. 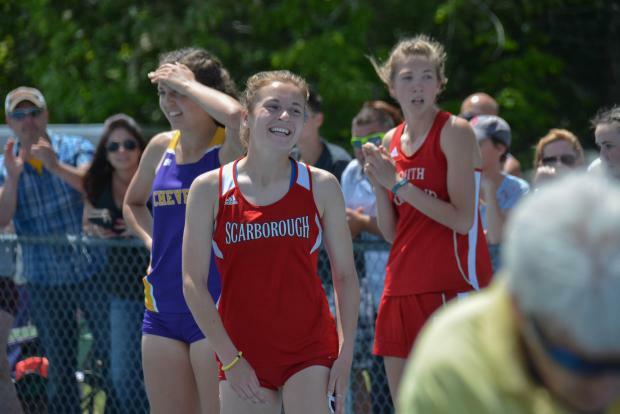 Scarborough's Bethany Sholl led for the first 1600 and stayed close after that even briefly retaking the lead in the sixth lap, but Beaumier and Shearer looked more comfortable. Entering the third curve in the seventh lap, just as the pair lapped the first runner, Shearer had established a lead of a couple of paces but Beaumier still ran with an air of implacable confidence. Four hundred meters later, as runners a lap behind shifted lanes to make way, the pair entered the home-stretch with Beaumier back in front. She'd stay there until the finish line crossing in 11:23.17 with Shearer still coming hard at 11:23.45. Beaumier, Toy, Kayla Raymond, and Emma Abbott had opened the meet taking the 4 X 800 Championship at 9:35.16. It was a title defense for the quartet as they'd won in 2017 in Waterboro. While Shearer took second in the 3200 for Hampden her teammate, Moxie Flanagan, took the title in the 1600 meter race-walk in a time of 8:11.23. Annah Rossvall collected the only title on the day for the Deering Rams running the 300 meter hurdles in 45.85 with margin of just greater than a second on Scarborough's Emily Labbe. Labbe had already won the most closely contested race of the day. Her time in the 100 hurdles (14.75) just bested runner-up Nina Tasker from Noble by 0.01. The race was too close to call and the runners had to stand in their lanes waiting for board to light up with result. As it lit up so did Labbe's face. 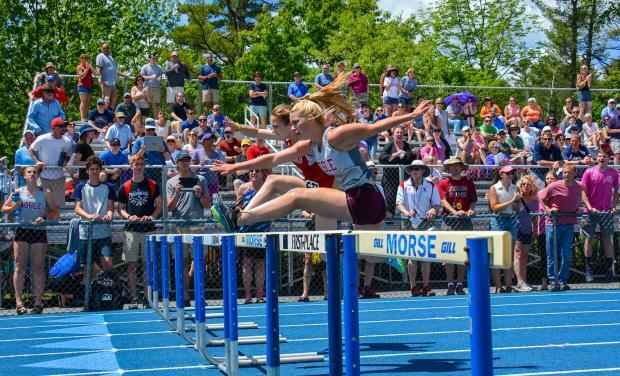 Tasker, a senior from Noble who also notched a sixth place medal in the 300 hurdles, has had an outstanding career, as three time defending champion in this event she just missed a fourth. She has two indoor titles at the 55 meter hurdles to round out the hardware. Maighread Laliberte and Jadah Adams continued Oxford Hills dominance in the throws by taking the titles in the shot put 37-09.5, and Javelin 135-07. Laliberte took the shot put and earned a new personal best in her last state meet. 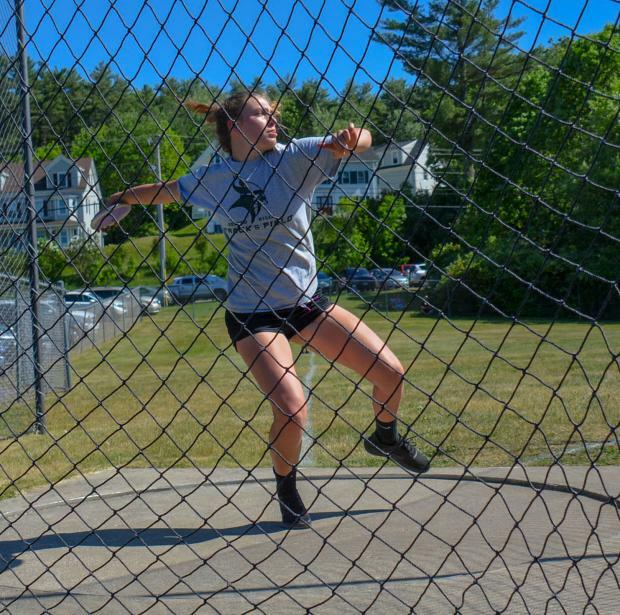 Adams who will return for the Vikings next season also notched a new personal mark while defending her 2017 title, but her throw also earned a spot in the record book. 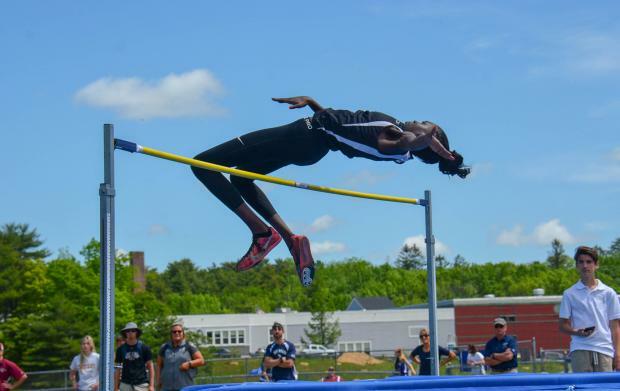 It set a meet record eclipsing the mark set in in 2011 by Keila Grigware of Biddeford and UNH. The Vikings also had a three event scorer in first year Taylor Haggerty with a fourth in the long jump, sixth in the 100 and seventh in the 200.